I've just finished re-watching Crumb, a doco that I own about cultural cartoonist, Robert Crumb. He visits his younger brother Maxon in San Francisco and discusses their time growing up and look at some of his paintings. The painting below that he's holding produced an intense flash-back to Madrid, where I saw Caravaggio's St Catherine of Alexandria at the Thyssen-Bornemisza Gallery. Both paintings feature intensely elegant, yet fragile-looking women, juxtaposed with aggressive, metallic forms. 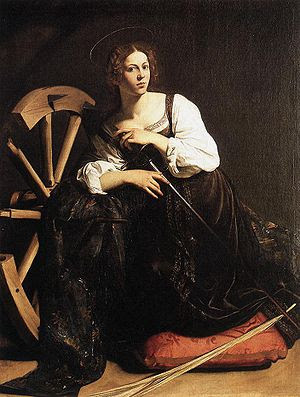 St Catherine is turning her head away from the impaling prongs, while brazenly stroking the blade of the rapier. I distinctly remember being captured by that stare and the angle of her head. 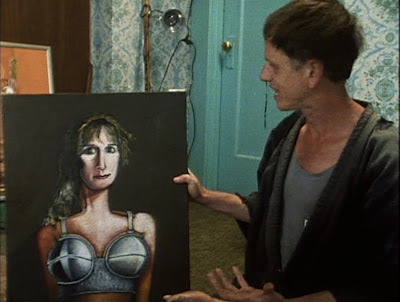 Crumb's painting has a female encased in a metallic bra, which he mentions, "...talks about her personality...". Both their expressions have an impish, puckish air about them. Just thought the comparison was kind of interesting. 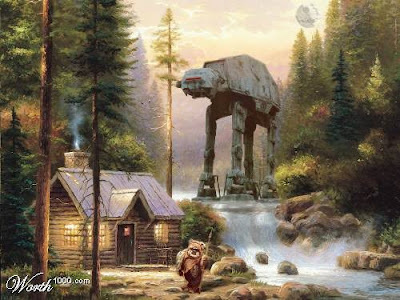 Thomas Kinkade, the self-proclaimed Monet of the millennium has been 'Endorized'. There's also another one of a large octopus devouring a Kinkade lighthouse somewhere out there on the net that I saw a while back. 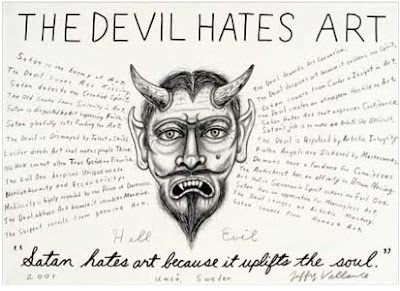 I think Vallance's quote talks more about art hierachies and politics rather than presenting religious ideas through art and I find his work is nestled closer to the christian art of the past: the use of narrative and imagery to instill comprehension through trepidation. If Vallance's was born during the Trecento, I would imagine him to be a predella painter - subtly subverting and questioning tenets through his use of extant symbols, all displayed in small format at the base of a formidable polyptych.